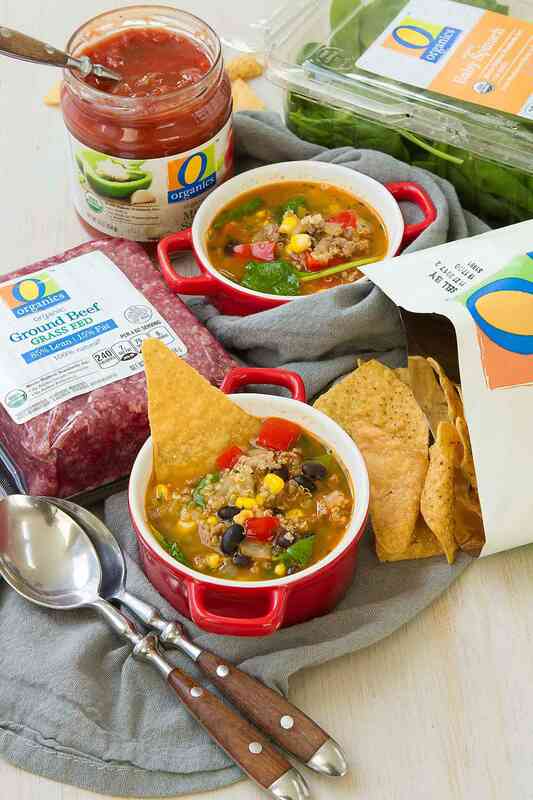 Get your dose of iron and veggies in a healthy and comforting bowl of Beef Taco Quinoa Soup. Great for loading up on vitamins in the cold and flu season. Thank you to Albertsons/Safeway for helping me share this recipe with you. All summer long, I long for the cool, crisp air of fall. I envision taking long walks, crunching through dried, fallen leaves and dreaming of red, orange and yellow scenes of sunny romance under the warmly-tinged light of autumnal skies. And then I wake abruptly from my Robert Frost-inspired daydream to the sound of the first sneezes of the season echoing down the hall from my kids’ bedrooms. I don’t remember Robert Frost ever alluding to cold and flu season while meandering down his road less taken! As soon as school starts again, my kids are subjected to a rigorous schedule of hand washing, water drinking and soup slurping. Meanwhile, I’m at the grocery store and in the kitchen, loading up on vitamin-rich foods and whipping up healthy comfort foods in an effort to ward off any nasty bugs that float our way. At the risk of jinxing things, we are on a pretty good roll of keeping ourselves healthy by loading up on vitamin C-rich fruits and vegetables, dark leafy greens, nourishing broth based soups, gallons (!) of green smoothies and antioxidant-filled teas and produce. Keeping up a regular schedule of exercise, whether that’s running, walking, playing soccer or running around the neighborhood with other kids, also seems to keep our energy and moods up as the days grow shorter and the rain more frequent. One of the amazing conveniences I’ve discovered while shopping at my local Safeway is the O Organics® line of products. Produce, meats, eggs, milk, snacks…the list of products in this line goes on and on. So, when I popped into Safeway the other day, I picked up the ingredients I needed for this healthy beef taco soup. Grass fed beef, spinach, salsa, tortilla chips, black beans, frozen corn and chicken broth. All organic and all at reasonable prices. Double happy dance! 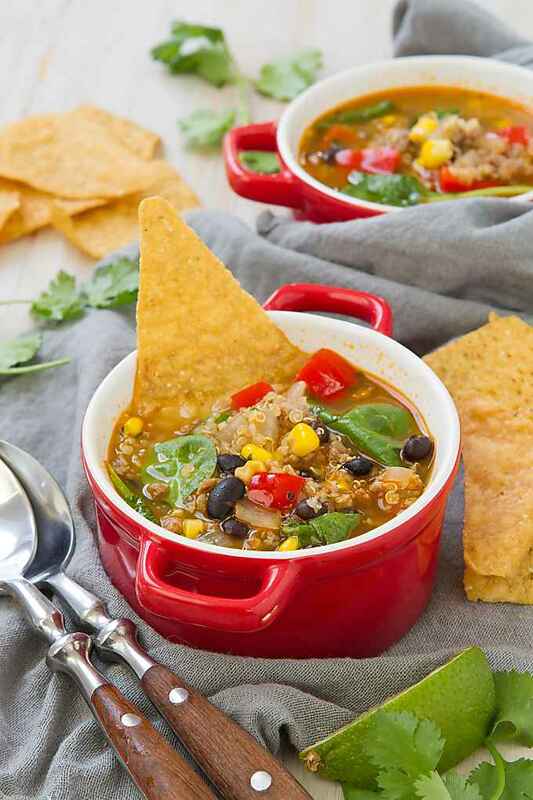 This beef taco quinoa soup follows the same formula as many of my broth-based soups. After making many (!!) light soups over the past few years, I finally reached the point where I don’t have to refer to a recipe to be able to produce a pot of nourishing soup. Now I can raid the fridge, using up any leftover vegetables, throw in some sort of meat or beans, maybe stir in some pasta, quinoa or rice, and come up with something delicious and healthy. Soups are incredibly forgiving. It’s pretty darn hard to mess them up, making them a great dinner option for home cooks who don’t always feel comfortable in the kitchen. 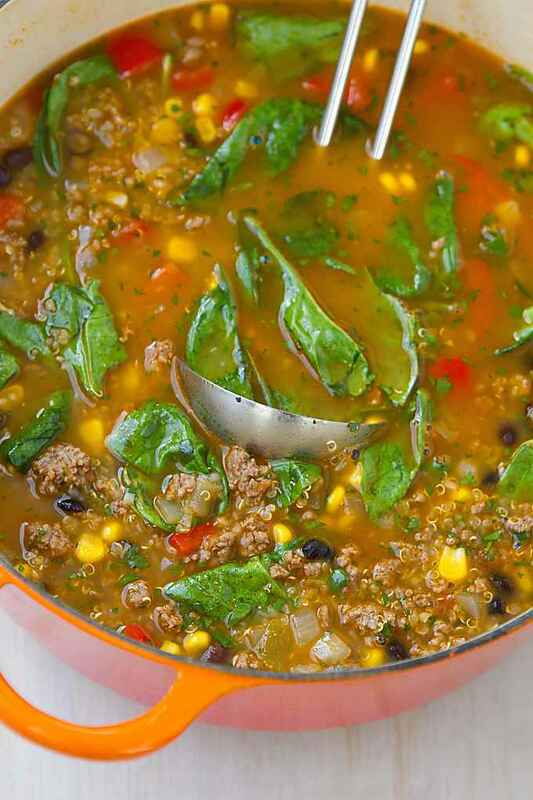 Standard taco seasonings – cumin, chili powder, paprika, garlic – take a starring roll in this healthy beef taco soup. But as soon as I saw the organic salsa on the Safeway shelves, I knew that it was just the thing for adding in an extra kick of flavor. I mean, who eats tacos without salsa, right?! I used mild salsa, but feel free to increase the spice by using the medium or hot versions. This beef taco soup is one I’ll be making over and over again. Aside from the health benefits of the iron-rich ground beef, and vitamin-packed veggies, my family loved the taste and everyone went back for second helpings. Every time I make a simple dish, I’m reminded that the quality of the ingredients makes all the difference in the world! My local Safeway had everything I needed for this recipe. O Organics® products are available in my area exclusively at Safeway and Albertsons stores. 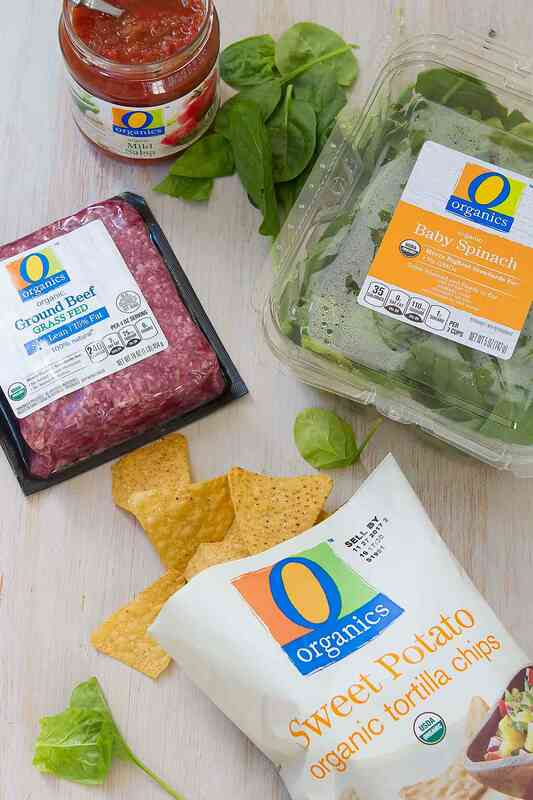 The O Organics® line includes USDA certified organic chicken and beef, and a wide range of other organic products. Not only do I appreciate the health and environmental benefits of this line of products, but they have such great flavor, which makes them a joy to cook with. If you don’t have an Albertsons or Safeway in your area, you can find the O Organics products at all Albertsons Companies family of stores, including ACME, Jewel-Osco, Vons, Pavilions, Randalls, Tom Thumb, Shaws, Star Market, United Express, United and Carrs/Safeway. Heat a large nonstick saucepan over medium-high heat. Lightly coat with cooking spray. Add the ground beef, season with salt and pepper, and cook, breaking up with a wooden spoon until cooked through. Drain and discard any fat. Transfer the ground beef to a bowl. Reduce the heat to medium and add the olive oil to the saucepan. Stir in the onion and red bell pepper. Cook until the vegetables are tender, 4 to 5 minutes. Stir in the garlic, cumin, chili powder and paprika. Cook for 1 minute. Add the chicken broth, salsa and quinoa. Bring to a boil, reduce to a lively simmer and cook for 15 minutes, or until the quinoa is translucent. Stir in the cooked ground beef, black beans and corn, and cook until heated through, 2 to 3 minutes. Remove from the heat and stir in the spinach and cilantro until the spinach is wilted. Serve with tortilla chips. Disclosure: This post is sponsored by Albertson’s and Safeway. All opinions are my own. This post contains links to my Amazon affiliate page. Any revenue made from sales through these links helps to support this blog. Thank you! I will be making this next week for dinner. Sounds delicious! This is so healthy and I bet it is filling too! This is such a great idea – so healthy and flavorful! I love taco soup and this version sounds soooo tasty! This sounds delicious and perfect for this time of year! Beef, taco and quinoa soup? You got me intrigued. This must be so delicious! Thank you for sharing the recipe! I wish I had a bowl of this for lunch!! 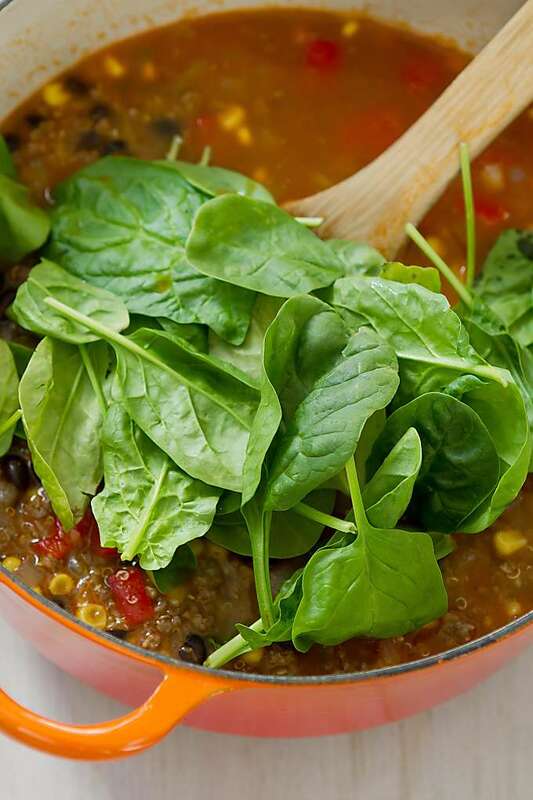 This soup looks so comforting, and I love the addition of spinach! In the list of ingredients the spinach and how much to use was not included. I’m assuming the entire 5oz bag that was shown in the photos would be the correct.amount in the recipe. Please advise. Hi Diann, I apologize for the omission. The recipe is correct now. I hope you enjoy the soup!